Stop me if this sounds familiar: anti-government protests pop up across the Middle East, creating a wave of unrest; a group of Sunni terrorists who call themselves the Islamic State wage an insurgency in Iraq, where Shi'ite militias and politicians dominate the country; anti-regime demonstrations and armed operations erupt in Syria, whose Iranian-backed president enrages the country's majority-Sunni population; and, meanwhile, the United States withdraws soldiers from the region. No, I am not describing the Middle East in 2011, but rather the region in 2019, although the description could apply to either case. And that is precisely the point. We do not know who said "history doesn't repeat itself but it often rhymes"—there is no substantive evidence showing Mark Twain, to whom the quote is often attributed, made the remark—but whoever did say it proved to be an astute observer. Developments in the region over the last several months, and especially in recent weeks, paint a picture of the Middle East's foreseeable future that is disturbingly similar to what unfolded from 2011 to 2014: the Arab Spring, the Syrian slaughter, the rise of ISIS, the near-collapse of Iraq, and the redeployment of America's finest. 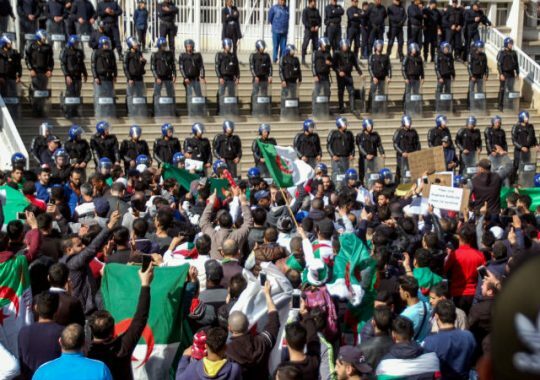 Mass protests began in Algeria last month, when President Abdelaziz Bouteflika, 82, announced his candidacy for a fifth term. Weeks later the government bowed to demonstrators' wishes, saying that Bouteflika will not seek reelection. On Monday, however, the president refused to resign immediately, as the protesters have demanded, and said he will remain in office past the end of his term in late April. A showdown seems inevitable if nothing changes. In recent weeks, protests against government repression and corruption have also occurred in Jordan, Morocco, and Sudan. Furthermore, the Syrian people have resumed protests and armed opposition against the regime of President Bashar al-Assad. The anti-regime activity has taken place primarily in southern Syria, especially in the Daraa Governorate, where protests first erupted in 2011. The popular opposition includes "defacing pictures of Assad and spraying anti-regime graffiti," as well as "assassinations, shootings, and bombings against targets of the regime and the militias aiding it," according to the Middle East Media Research Institute. Of course protests and even militant activity do not mean another Arab Spring—so far no regime has fallen—but their very existence, and their geographic expansion, should not be downplayed, either. The conditions that led to the Arab Spring were never changed, so it should not be so surprising to see similar events play out again. Either way, as Jackson Diehl notes, the recent unrest shows how "the authoritarian restoration that was supposed to return political stability to the Arab Middle East and open the way to economic modernization has failed." Clearly dictatorships are not bastions of stability, nor are dictators bulwarks against terrorism—if anything, they drive more people toward jihadist groups. One popular argument in favor of Middle Eastern authoritarians is that, while they may be nasty, they prevent the rise of Islamist terrorist organizations, such as ISIS, which, like the Arab Spring, may be poised for a return. Voices touting the collapse of ISIS's so-called caliphate, its physical contiguous proto-state in Iraq and Syria, risk missing an important development: the group has returned to a full-blown insurgency in Iraq. ISIS has been planning for the day when it is driven underground since at least 2016, and is modeling its current strategy on what it believes worked the last time the Americans drove it underground in 2008-09, after the surge in Iraq. The group is carrying out hundreds of targeted assassinations and mass-casualty attacks, trying to terrorize Sunnis so they do not collaborate with the Iraqi government. Meanwhile, tens of thousands of ISIS detainees currently sit in Iraqi prisons or camps, and another 20,000 Iraqi prisoners are in Syria and set to be transferred to join their comrades in Iraq. The picture is no less bleak in Syria, where thousands of additional ISIS fighters are either detained or roaming ungoverned parts of the country. This only touches at the surface of why ISIS still has the personnel out there to rise again. Critically, the current situations in Iraq and Syria are strikingly similar to what they were when ISIS rose to prominence from 2011 to 2014. Now as then, Shi'ite militias and politicians control Iraq. It is true that, with American soldiers still in the country this time, the political leadership will likely not pursue the same anti-Sunni sectarianism as former Prime Minister Nouri al-Maliki did at the time. But Iranian-backed Shi'ite militias are growing more powerful and assertive in Iraq, where they meet little resistance. With these violent thugs looking to increase their influence, it is all too likely that they, and other militant Shi'ites, will drive Sunnis into ISIS's eager hands, as was the case at the beginning of the decade. With Syria potentially on the path to further conflict between the regime and opposition forces, Syrian Sunnis may again turn to extremist groups like ISIS. It is all too clear that Assad and his allies in Iran will use savage force to slaughter his opponents. Recall how ISIS grew in power after the surge in Iraq drove the terrorists underground. Fighters in what was then the Islamic State of Iraq waged an insurgency, as they are now, before moving to Syria when the conflict broke out there. They gained revenue by exploiting the oil fields in eastern Syria, and gained recruits along the way. The group rebranded itself to become what we now know as ISIS and, in 2014, stormed back into Iraq, seizing one-third of the country. It is not difficult to imagine this movie having a sequel. Amid such chaos, Iran is poised to make gains across the Middle East, as it has done since the Arab Spring, entrenching itself in Syria and exploiting weak states to expand its influence. And, meanwhile, the United States is eager to withdraw most of its troops from Syria and has expressed exhaustion with the Middle East more generally. True, the Trump administration has done nothing in this respect as reckless as Barack Obama withdrawing all troops from Iraq in 2011, but the same desire to exit the region exists in both political parties. No one knows for sure what will happen in the Middle East over the next several months, but there are enough signs to suggest that history is about to rhyme. This violent cycle—of protests, violent repression, and a surge in extremism, before tyrants restore order—will continue as long as Iran and its network of allies pursue their belligerent drive for regional dominance, Sunni terrorist groups are able to survive, and incompetent, oppressive authoritarian regimes endure. If the United States is unwilling to launch an open-ended, comprehensive strategy seeking serious social and political reform in the Middle East, then at the very least Washington needs to commit to a long-term military presence in the region, supporting allies in the most important fights and deterring malign actors from causing trouble. There are few if any good options in the Middle East. But retreat is the worst of them all. This entry was posted in National Security and tagged Iran, Iraq, ISIS, Islamic Extremists, Middle East, Syria, Terrorism. Bookmark the permalink.